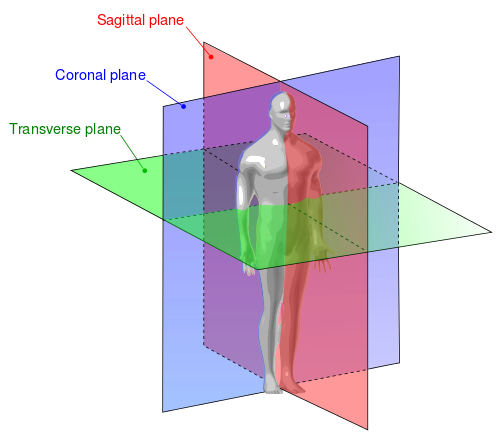 The human body is split into 3 different body planes: the transverse plane, the coronal plane, and the midsagittal plane. Also known as the horizontal plane, the frontal plane, and the median plane. 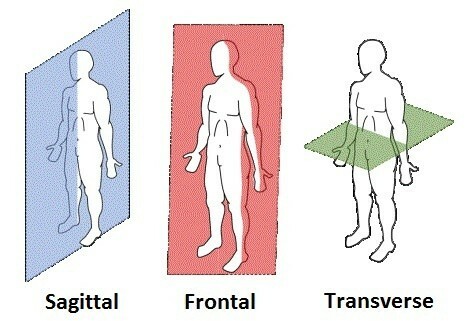 The three different planes are pictured and labeled below. Every plane has two separate sections that make up each of them, shown in the picture above. Each plane has specific names for both sections which will be named in the next few sections. The midsagittal plane is split down the midline of the body vertically which passes from anterior to posterior dividing the body into right and left halves (shown below). Both halves are referred to as the laterals, sometimes called the left and right laterals, and the section down the middle of the body towards the line is called the medial. The coronal plane is a vertical plane that divides into the ventral and the dorsal sections of the body (shown below). The two parts of the body are referred to as the anterior and the posterior sections. The anterior section is the front half of the body where the stomach is, and the posterior section is the back half of the body. 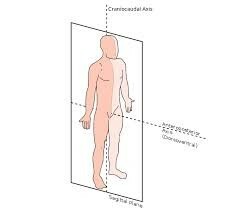 The transverse plane is a horizontal plane, also called the axial plane or transaxial plane, that divides the body at the waist and splits it into two sections (shown below). These two sections are called the superior and the inferior section. The superior section is the top half of the body from the waist up containing the stomach area, arms and head. The inferior section is the bottom half of the body from the waist down and contains the things, calves, and feet. 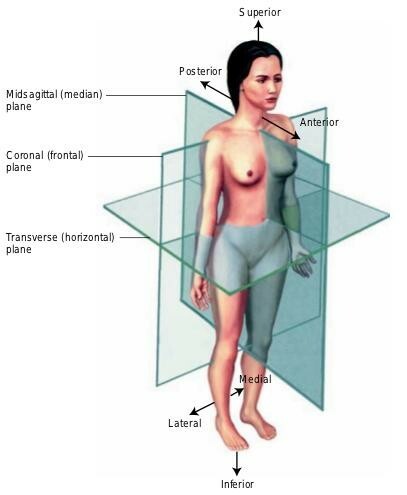 The transverse plane is also perpendicular to the coronal and the midsagittal planes. Above shows the body planes and sections from different views of the body. Above shows the body planes and sections labeled. Above shows the body planes all put together on one body.